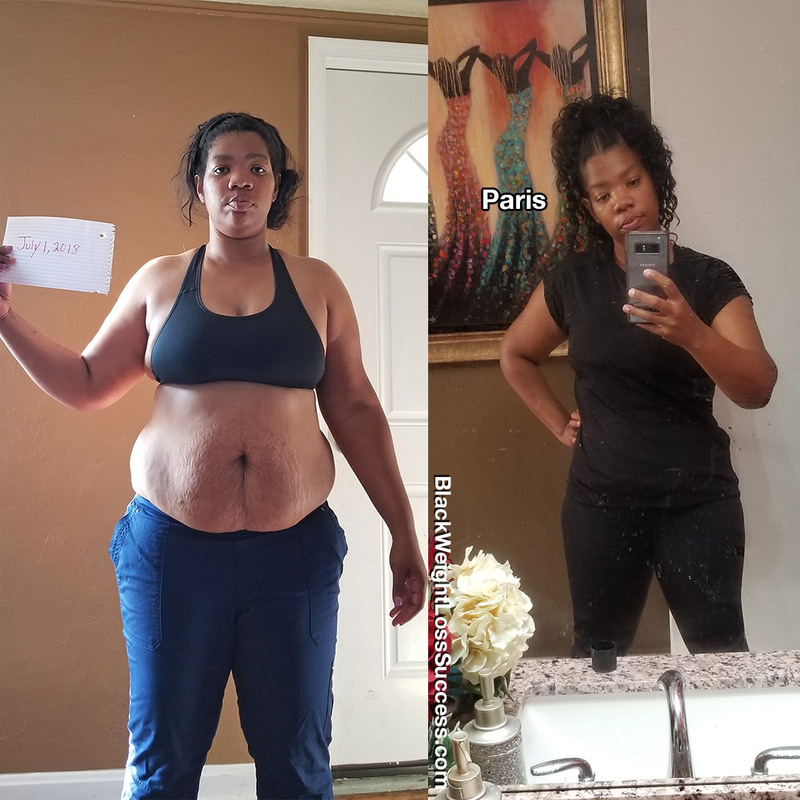 Transformation of the Day: Paris lost 50 pounds in 5 months. Working out six days a week and eating lots of healthy food worked for her. She was inspired by the trainers, fitness routines and success stories she saw on Instagram. 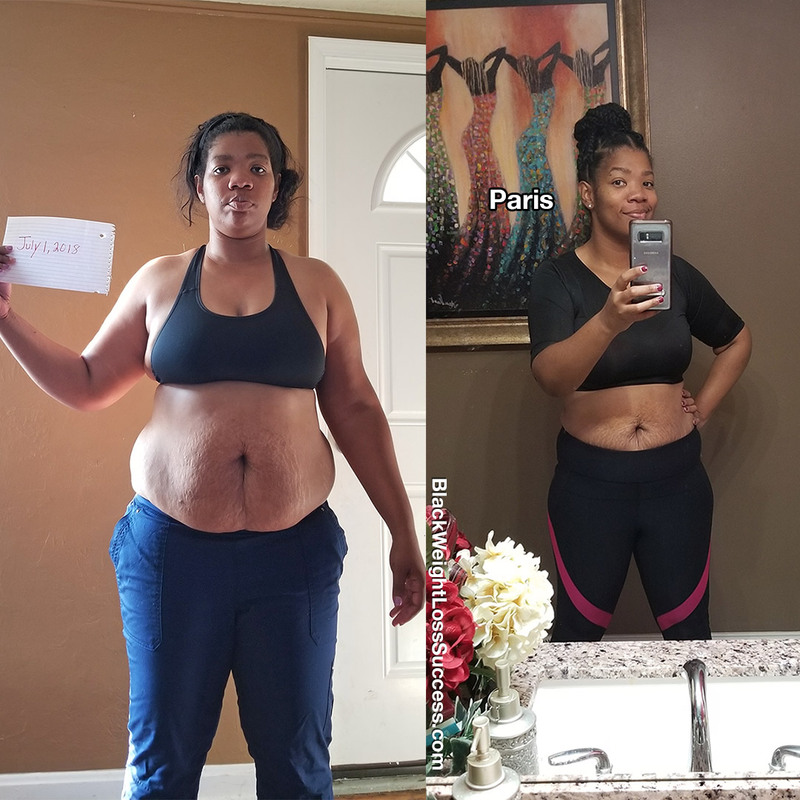 My journey began in July 2018. In the beginning, I weighed 220 pounds. I worked out with a personal trainer three days a week. I also worked out on my own three days a week. Six days a week, I did anywhere from 200-800 crunches, 500 jump ropes and 500 squats. Jumping rope is my absolute favorite workout. Taking long walks was therapeutic for me, so I enjoyed that as well. I also incorporated 10-15 lb weights in various workout routines. Every morning I would take one teaspoon of Black Seed Oil. My diet consisted of baked or grilled chicken, fish, turkey, vegetables and lots of water (I the equivalent of half of my weight drank daily). I ate minimal carbs, but I also ate fruit as a snack to satisfy my sweet tooth. I did not eat after 8:00 pm. I used Herbalife shakes as a meal supplement. The shakes kept me full, and I never had the urge to overeat. Currently, I weigh 170 pounds, so I lost a total of 50 lbs in 5 months. I didn’t have any form of weight loss surgery. Various groups and trainers motivated me I would watch on Instagram and all the before and after photos and success stories I saw. I would watch and duplicate routines. As the weight began to fall off (in a month), I just wanted to keep going. One thing I learned about myself was that I am much stronger than I thought. I would love to continue this fitness journey and inspire others. I want to continue to learn from others as well. The advice I would give to people that desire to lose weight is to pray, surround yourself with positive, motivating people, write down your goals, map out a plan and execute. When you are struggling and discouraged, reach out to those that will be there to cheer you on and help you stay on track. Know that it is ok to fail, but NEVER give up. Great job you look good. I am just starting my journey of clean eating. I haven’t incorporated a workout routine yet but I am going too. Thanks for telling your journey. Thank you!! And good luck on your journey. If you ever need any tips or words of encouragement please let me know!! Thank you!! And good luck on your journey Queen. If you need any tips or words of encouragement please dont hesitate to contact me. Congratulations Paris!!!!! You love AWESOMELY AMAZING!!!!!!! Thank you!! I’m very happy to hear that. Those pictures weren’t easy to post. But my purpose was to inspire. You mentioned 200- 800 crunches, 500 skips (jump rope) and 500 squats. Did you do that daily or weekly?